This piece was sold as “probably Saryk”, the white is cotton. Would have loved to have more info on it, fx if it is in Khorjin or Mafrash format when lifted of the chair (according to the seller it looked complete). The Elem match what I would except once have been the layout of the lower end of my Aksu piece. It is sometimes a small world, who knows perhaps someone here knows where the chair is now? Last edited by Martin Andersen; November 6th, 2017 at 09:18 AM. Maybe it's just me, but I cannot get a definitive view of the knot asymmetry. Would you mind trying to get a good clear shot, maybe folding back along a weft line ? Bravo on the photography. Those are open right, asymmetrical, no doubt. Rich is correct, those are good shots, and yes, AsymR. For me, that rules out Saryk work (as far as anyone can rule anything out, given that we actually know so little). 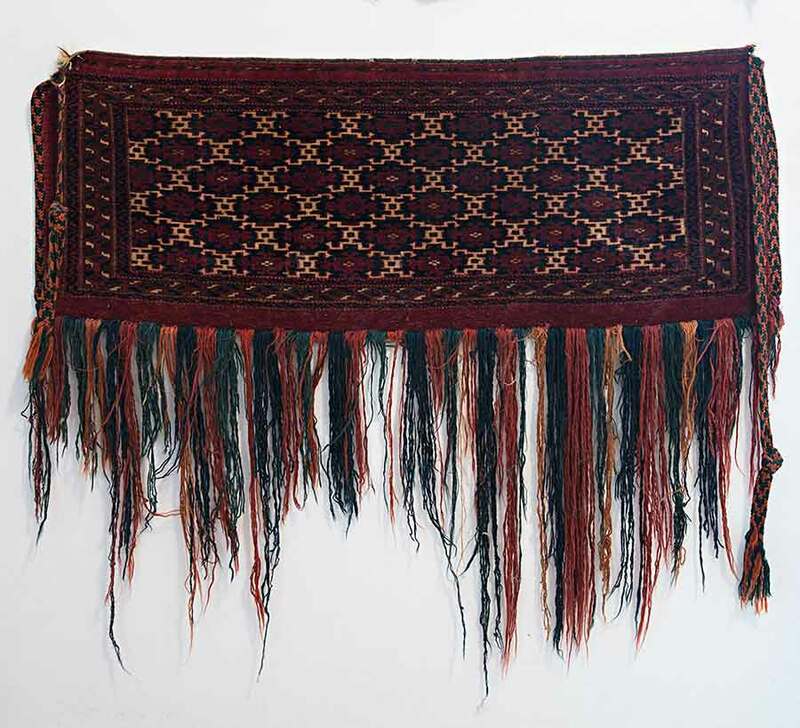 There an ak-su torba out there in the interverse with open right knotting; the seller has deftly avoided criticism/conflict by just calling it Turkmen. My reflex take on Martin's frag, based largely on palette, with a minor chord played from the cotton section, is that it doesn't look Tekke. Maybe I have led too sheltered a life. Does it strike you that way, technical specs notwithstanding? I presume you are referring to what seems to be a relatively dark palette. I think judgement of the palette is deceptive because so much of the border area is gone. What little is there, is consistent with Tekke, and undifferentiated Middle Amu Darya (typically AsymR) , and pieces such as the late MAD Salor chuvals. The relatively large area of the face devoted to silk is also consistent with both sources. 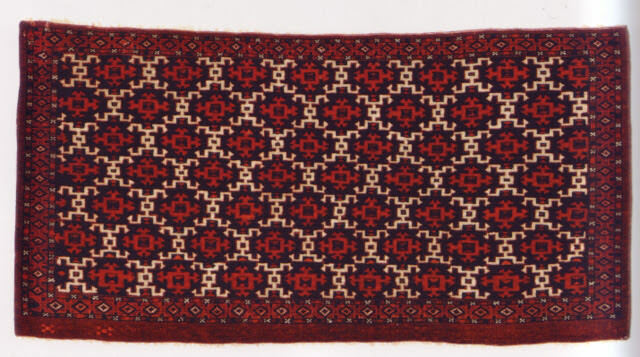 That border/end panel motif treatment is common on Turkmen khorjins from several weaving groups (which is why I still have a nagging Yomud opinion as well). For me, the unusual occurrence of ak-su on a small bag is enough to wonder about MAD origin. 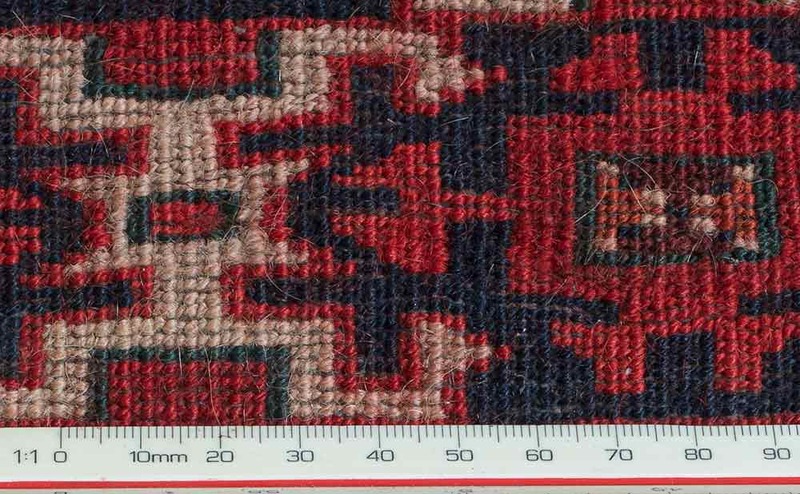 Almost all ak-su torbas that I've looked at over the past few days have the dark blue outline on the main motif, including the Salor examples (that's why I wanted to have a good look at the knots, but nope, no AsymL). Good point about the missing parts! Plenty of regular madder red there, I am sure. 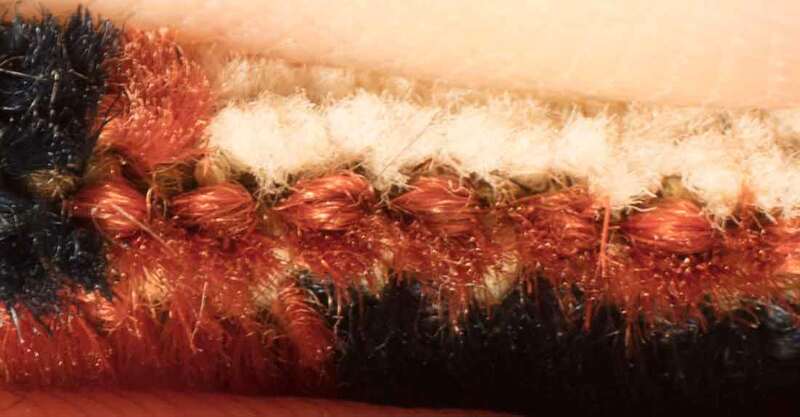 the white in the close-ups of the knots looks like wool, not cotton. In Peter Stone's book on tribal and village motifs, he mentions - but does not show - a Veramin Arab saddlebag with the ak-su motif. Dark palette. Sound familiar ? Last edited by Chuck Wagner; November 8th, 2017 at 03:17 AM. Regarding the outer missing framing there is of course no way of knowing. But on all Aksu pieces I have seen the color from the “gols” in the mainfield (or the color from the main border) is repeated as outer frame. A clear red madder framing repeating the small parts of the guard border on my piece would have been beautiful and in high contrast to the mainfield, but also aesthetically a bit strange compared to what else exist. And I am fairly sure the white is cotton, the closeups might misrepresent texture a bit because of the digital sharpening. Here a photo of my Tekke Mafrash Aksu, size ca. 78 x 70 cm including fringes. Very very fine knots, haven’t counted them, but sure it is a higher Kpsi than the other. In this there is nothing which have made me uncertain about it being Tekke. I suddenly remember I might have a MAD Aksu somewhere (not terrible exciting so it have hidden itself somewhere, I will try to find it). Veramin I find unlikely for my piece, but would be very interesting seeing how the Veramin used the Aksu pattern in saddlebag format. I still think the Khorjin format is a possibility because of the "Elem". Last edited by Martin Andersen; November 8th, 2017 at 01:18 PM. Since writing the last post I found a photo of the Veramin piece in a book by Parviz Tanavoli, and while having an accurately drawn ak-su motif, it's nothing at all like your piece. And I never thought yours was anything other than Turkmen. I would still be curious to see the Veramin, if its not too much trouble. 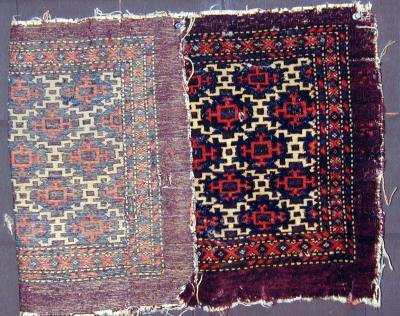 It is generally interesting how the Veramin adapted Turkmen patterns. Here some photos of my “not terrible exciting” MAD Aksu (it is one of those ebay buys where you fool yourself into hoping the photos of the colors could perhaps be wrong - it will quickly go into hiding again ). The size is 83 x 42 cm, and open right. Not much nice to say about it, perhaps except with some good will a nice green and reminisents of fringes, and I suppose around 1900 wouldn’t be unthinkable. Obviously hot running red. Last edited by Martin Andersen; November 8th, 2017 at 01:34 PM. Thanks Joel, interesting to see it. I think I have seen Veramins a bit more faithfull towards their possible Turkmen design origin. In the Eagle Group the Asku design seems to be well-represented, actually surprisingly over-represented compared to its frequency in the other tribes/groups. The Aksu seems to be the most common Eagle Group pattern for small formats. John Taylor have collected 27 pieces on his Rugtracker blog. None of Taylors samples are of course with the white Syrga border or are in my very small format, but some of them looks like they have a purple insect dye mainfield. 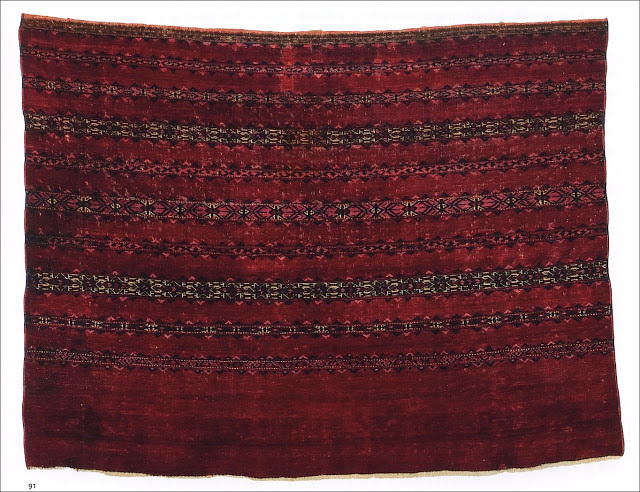 The structural criteria for Eagle Group is as far as I understand established mainly by the structure of the weft in main carpets. 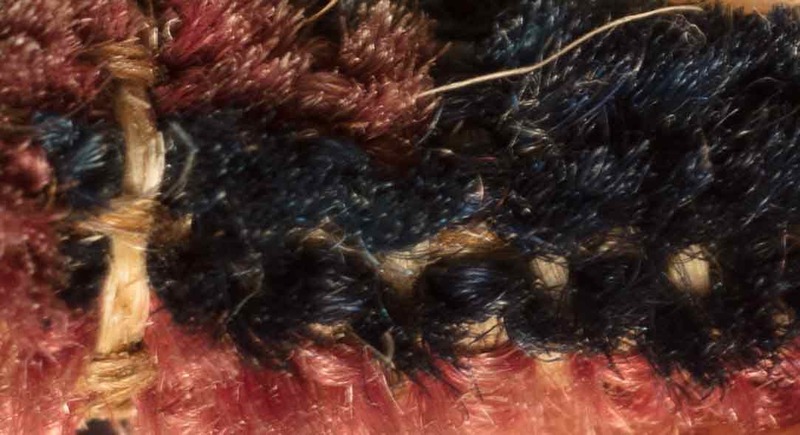 But i am not sure if all the smaller Eagle Group pieces by definition are required to have silk and cotton in the weft? Or if some of the smaller pieces are attributed by layout/colors of pieces which meets the structural criteria for Eagle Group? Well I suppose Eagle Group attribution perhaps should be taken with some cautiousness, I can easily see sellers and auctions gladly putting on the label. Last edited by Martin Andersen; November 8th, 2017 at 05:04 PM. 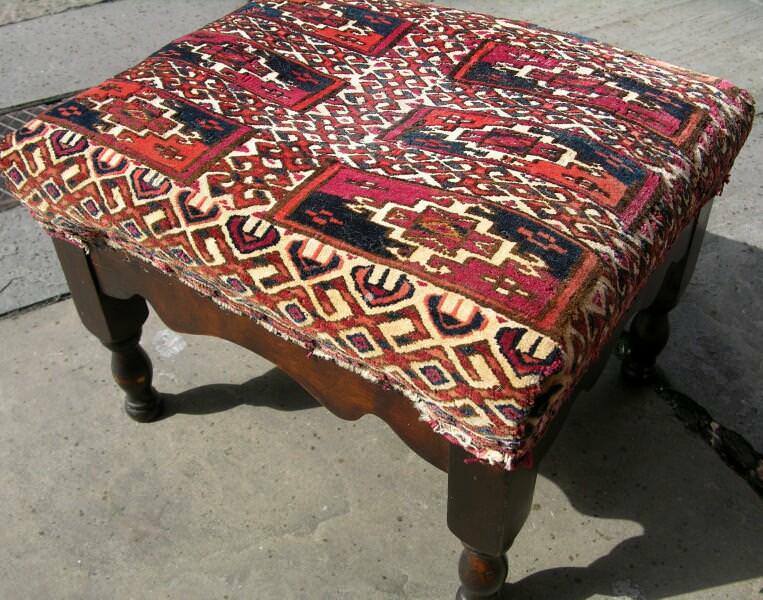 Here a beautiful Tekke Torba from a facebook friend. The white is cotton, the purple is silk and the Kpsi is 324. Though the Ak Su / Aksu pattern is rather uniform, there are some variations which I am beginning to get kind of hold on, fx in regard to diagonal colorshift in the rows of the “Gols” and their blue/blue-green background color (it’s often difficult to se in photographic reproduction). I still think the missing out frame on my originally posted piece would have to have been a purple cochinielle /insect dye (and not red madder) otherwise the contrast between mainfield and outer framing would have been to contrasting compared to what is else around. But of course no way of knowing. 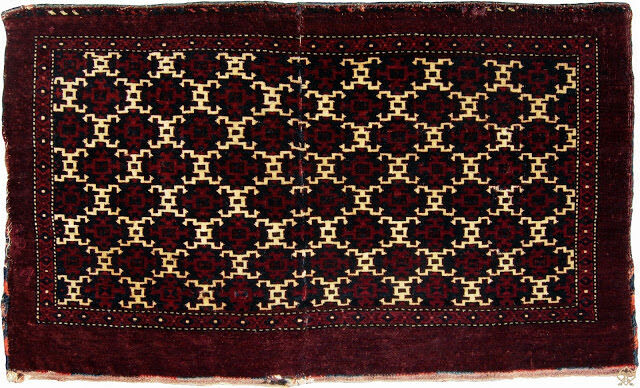 And I am still looking for more directly comparable material to my piece, the border, the square format, the elem in combination with the Aksu pattern seems unique, so if any here also in the future finds comparable material in these aspects I would be happy to know. 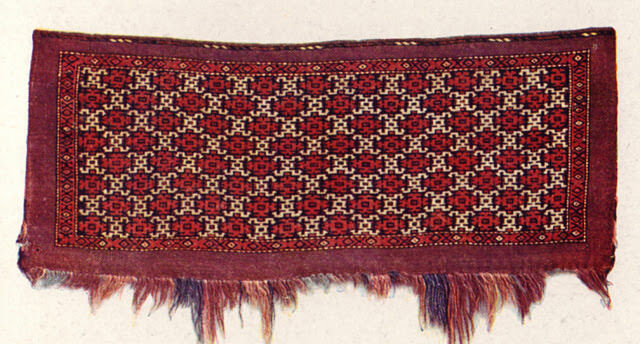 Using a search on Google Images - today - with "Ak Su torba" as the search criteria, there is currently a torba with the single-kotchak motif (latch hook) along the upper edge in the results. 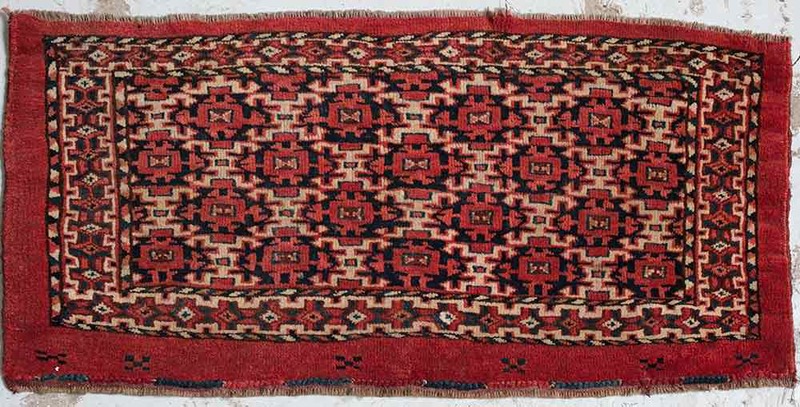 It is on the market, on a very well known rug site, so I can't say much more. It does not appear to be quite the same form as yours, which is more like the Tekke and Varamin small bag elem device. Similarly, the criteria "ak su bagface" will - today - dredge up an image of a small bag (also on the market) with dimensions similar to yours, but much newer and less traditional, based on colors. And, your facefriend's bag is very nice. 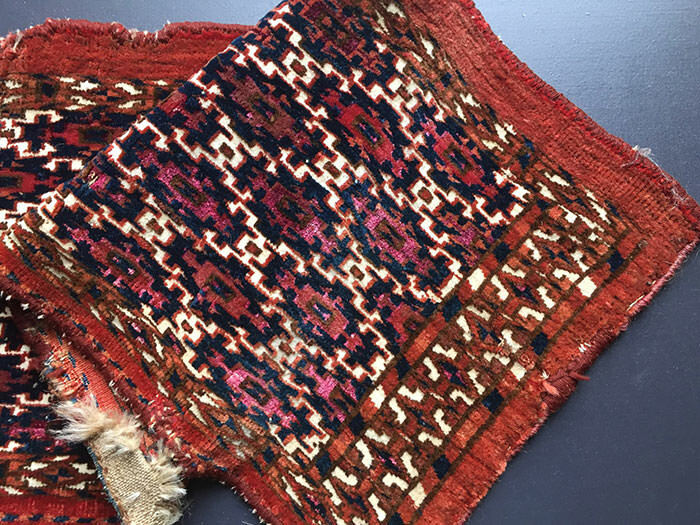 For what its worth: the weft to me looks like light brown fine sheep wool, and the warp like slightly less fine white wool, quite comparable to other Tekke pieces I have that I would think old.